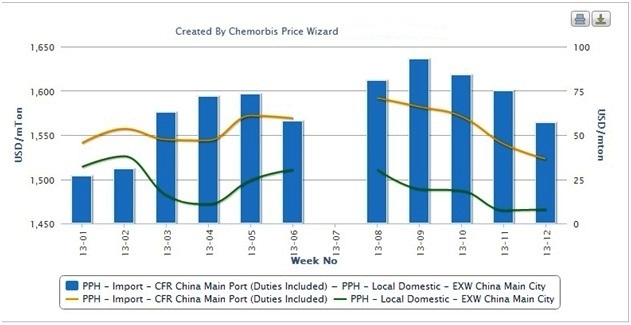 According to data from ChemOrbis Price Index, the premium import homo-PP prices carry over domestic materials narrowed for the third consecutive week and now stands at its lowest point since the week before the Chinese New Year holidays. Consecutive price reductions from overseas sellers along with domestic producers’ attempts to stabilize the market were cited among the main reasons for the shrinking premium carried by imports over local materials in China. After taking customs duties into account, import prices first moved above local prices around the middle of December and have retained a premium over the domestic market ever since. 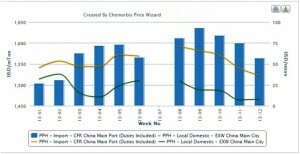 In the first few weeks after the Chinese New holidays, when import sellers announced ambitious March increase targets while disappointing demand compelled local sellers to lower prices, the premium carried by imports over local cargoes soared to just under $100/ton. Since hitting this high at the end of February, the premium held by imports over domestic cargoes has been steadily moving lower and now stands at just over $55/ton.